Alien Bee: First Set Photos From STAR TREK 2 Show Spock, Uhura And New Villain? 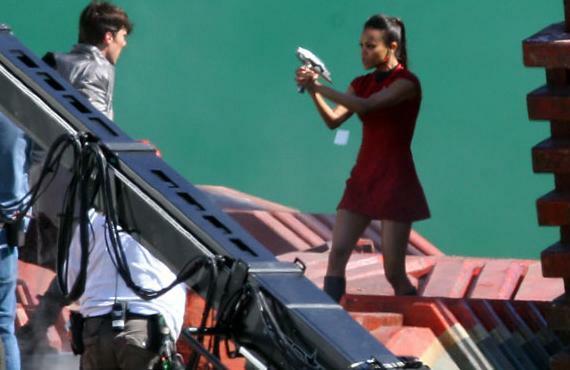 First Set Photos From STAR TREK 2 Show Spock, Uhura And New Villain? These are the first set photos that have been released from J.J. Abrams' STAR TREK 2. 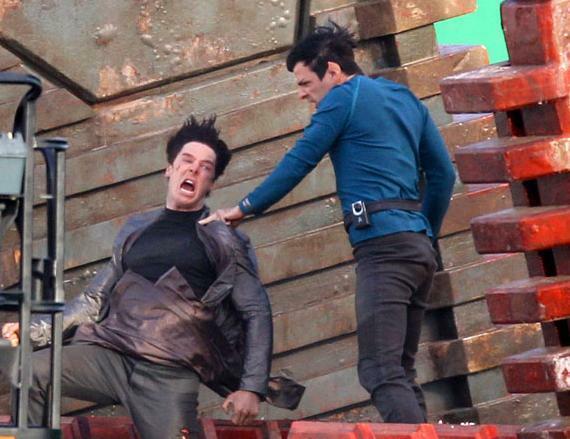 The first image shows Zachary Quinto as Spock fighting Benedict Cumberbatch's character that is still unknown but I guess he's one of the villains from the still untitled film since they are going at it and Spock has his Vulcan death grip in use. The second image shows Zoe Saldana's Uhura and Cumberbatch in from of a green screen on what is being described as "a space barge set". Star Trek 2 will hit theaters on May 17th, 2013 and in 3D.